Okay, everyone turn to your right and look creepy. No, creepier. Like something out of Norman Bates’ childhood. Back in the early nineties, I subscribed to Nintendo Power. Video games had a pretty harsh stigma back then; not yet harsh enough to brand everyone with an SNES a school shooting waiting to happen, but you still didn’t talk about them unless in a safe zone–usually the woods behind the school playground during recess. The fact that someone bestowed upon us a magazine–a monthly periodical–that not only talked about video games, but provided screenshots, illustrations, top-secret cheat codes and all that other stuff that the internet would eventually render moot, well…who wouldn’t subscribe to it except old people born before the advent of video games and all those weirdos who never talked about anything but hockey and basketball? As a kid, who couldn’t play games all day long, I got my unwired fix from Nintendo Power, along with all my news about upcoming and recently released games. Interestingly enough, if you look through the covers of issues released from January 1993 to December 1994, you might find a lot of games I happened to have in my personal collection. Dogs, apparently, live in giant blocks with no doors or windows. One game, though, touted in my first issue and hyped for at least the duration of 1993, never really appealed to me. Nintendo Power loved it, though, for something it called the Super FX chip, which ten-year-old me understood only enough to know it somehow advanced the technology of the Super Nintendo to produce things never before seen in video games, somehow improved the system far enough to deliver unto us the magic of hyper-realistic, futuristic, uh…flying triangles? Nintendo Power targeted ten-year-olds, which unfortunately meant a somewhat dumbed-down explanation of their subject matter. It didn’t bother to explain how the SNES needed help with things like frame buffering, scaling, and polygon rendering. 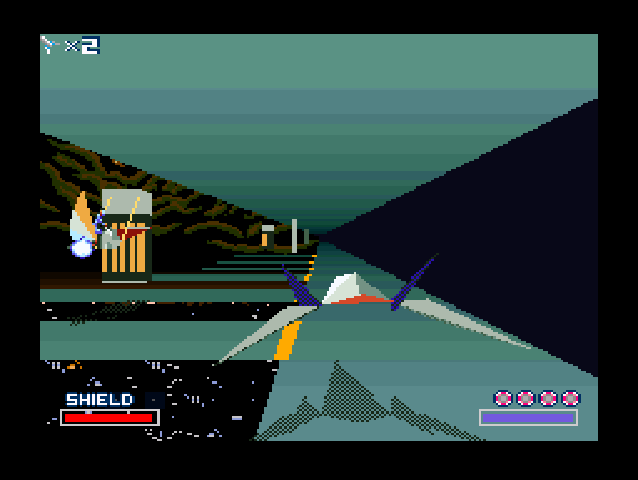 As a result, Star Fox appeared to me as only a blank, empty-looking game about flying a triangle through space, shooting at things I could have easily drawn in my computer’s paint program. Still, I remembered the full year’s worth of comics printed in the magazine, the weird TV commercials, and, of course, enjoying the N64 game, so when I started this blog, the SNES Star Fox went on my list of games to play. I think I designed something like this on my Laser 386sx. The instruction manual only drops hints of a story. You know where you need to go, who and what to shoot down, and a little detail behind some of the planets in the Lylat system, but unless you’ve played Star Fox 64, considered more of a reboot than a sequel, the game just assumes you don’t need to know the details behind the mission or any moral qualms between the characters, and that you’ll just blindly follow instructions like a good soldier. Either that or it figures none of the ten-year-olds who bought the game after seeing it in Nintendo Power will care about anything beyond “outer space battle with animals.” Still, for those of you unfamiliar with the series, damn dirty space ape, Andross, has launched an invasion of the dog planet, Corneria from his base on planet Venom. Cornerian General Pepper has called on the help of Fox and Friends, who unlike their counterparts on earth, want to detain Venom rather than spread it. When starting the game, the player selects one of three courses through the Lylat system, each one corresponding to an easy, medium, or difficult mode of play, indicating either that Andross had the courtesy to only invade a minor, easily liberated chunk of the solar system, or that Fox hasn’t figured out that he could probably just fly straight to the final stage and begin his invasion of Venom immediately. Did someone forget to finish programming the boss? After selecting a course and hearing a message from General Pepper that qualifies more as “small talk” than an actual briefing, Fox and team launch their arwings and the player immediately begins…flying a triangle around a series of rectangles and dodging diamonds. Honestly, this game should have clued Nintendo in to the potential failure of the N64. 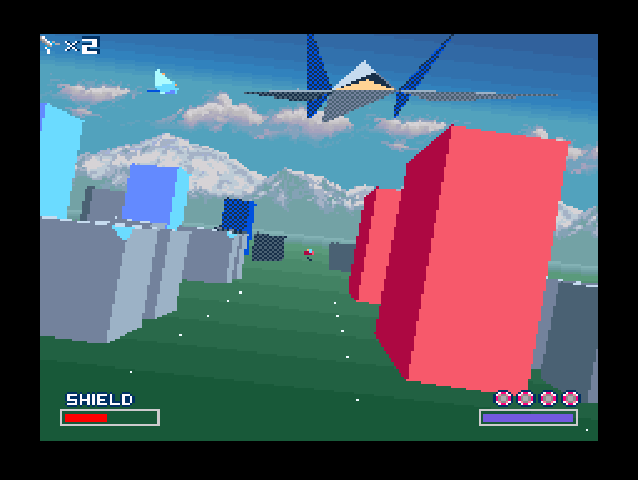 Since the Super FX chip essentially turns Star Fox into a 64 game on the SNES, using scaling and rendered polygons, the fact that it didn’t immediately become the standard against which we judge all SNES games should have indicated that more advanced technology doesn’t inherently translate to better games. I enjoyed the game, but playing it gave me a strong Star Fox 64 vibe, along with the little voice in my head constantly asking, “Why don’t you just go play that game instead?” It almost felt like playing a developmental demo for the 64 game, without skins and details added to make the world look like something other than flying through a geometry textbook. Pshh. 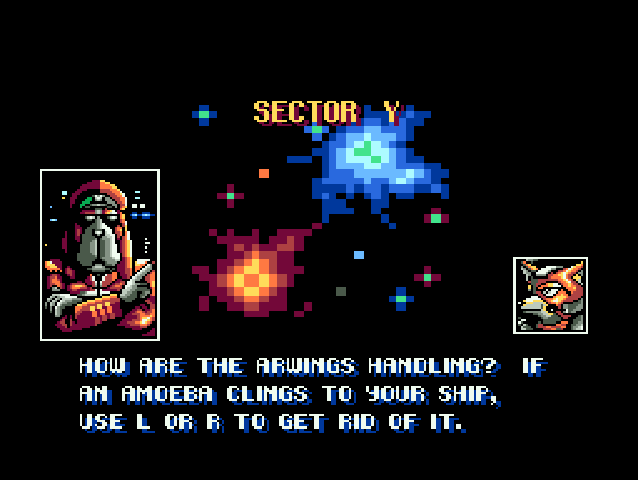 I think I know what to do if an amoeba attaches itself to my star fighter. I could mention other things about the game, such as the outer space water level, where all the objects that usually float through the ocean now float through space, or the dinosaur level which would eventually become the basis for Star Fox Adventures. The SNES game features most of the same power-ups as the N64 installment, albeit fewer of them, and picking up some items, like the health rings, demands a targeting so precise that the only people who possess the skills can also shoot the center out of a dime placed inside a safe using an airsoft gun. Even if you do manage to pick one up, its healing power ranges somewhere in between a good band-aid (on the high end) and the power of positive thinking. The halfway points restore a substantial portion of your ship’s shield, but they only give you one per level and don’t come before boss battles, so prepare yourself for playing through half the level every time a boss knocks you out with one hit because you had to play through half the level to get to it. That last point really gets in the way for me. I like this game, and I would play it more often, but I play games differently now than I did twenty years ago. Back then I didn’t get bothered by repetition or time-consuming early levels. I had more patience for practice. Having owned Nintendo products instead of Sega, I can never reach the skill at Sonic the Hedgehog that I still have at early Mario games. 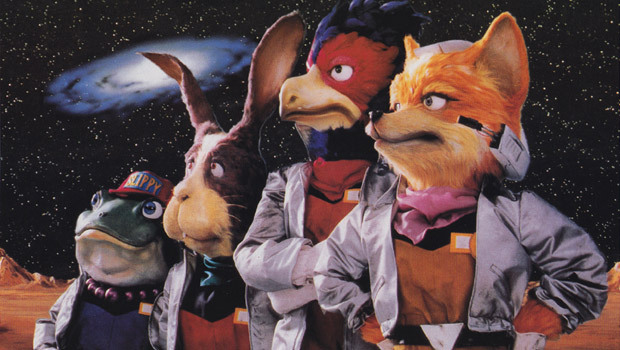 Star Fox demands that kind of player, the kind who will patiently work through problems and develop a skill. Either that or save states. I could get through the game with save states. I actually don’t have a problem with this. Anyone else? No? Good. The technology, as I’ve mentioned, impresses the tech people more than the players. 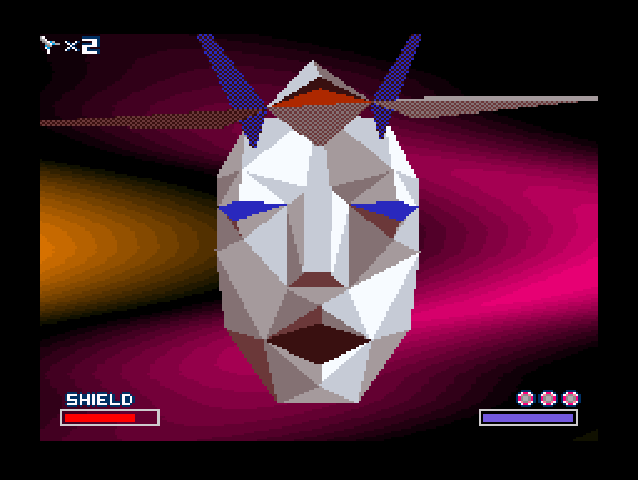 At the beginning of the mission, a synthesized voice tells you, “Good luck!” (Which sounds more like “Greeblock!”) Pre-sampled tones synthetically garbled make up suggestions of character voices, an idea later implemented in Star Fox Command; kind of neat, and undoubtedly difficult for a 16-bit processor to pull off, but they don’t really enhance the experience beyond what we’d get from Final Fantasy VI or a Link to the Past, which focused on complex story and gameplay, resulting in far better games. I may even argue that many 8-bit games, like Mega Man or the original Legend of Zelda, offered more to their players. 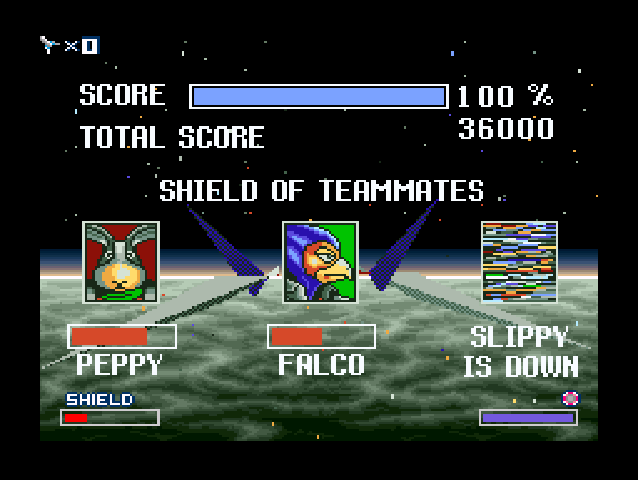 I don’t want to give the impression that I have no respect for Star Fox, but unless you want to play it for curiosity or out of a die-hard love of the series, you may just want to go straight to Star Fox 64. This entry was posted in SNES, Star Fox and tagged SNES, Star Fox. Bookmark the permalink.